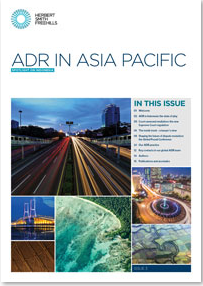 The third edition of our ADR in Asia Pacific Guide spotlights alternative dispute resolution (ADR) in Indonesia. We summarise the state of play in relation to ADR in Indonesia and its interplay with adversarial processes like litigation and arbitration. We delve into the detail of the Supreme Court's new mediation regulation and decree and analyse how these hope to improve rates of settlement. We then look at some practical aspects of mediation and dispute resolution from a lawyer's perspective, highlighting the often novel way in which mediation is deployed in Indonesia. Finally, we summarise the ground-breaking Global Pound Conference (GPC) series which looks at all dispute resolution processes and how these can be improved for commercial parties. Herbert Smith Freehills is proud to be global founding sponsor of GPC.